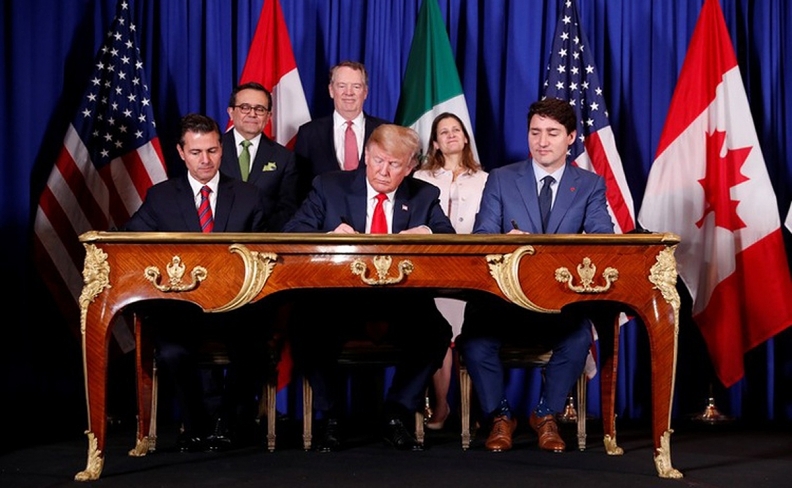 President Trump, Canadian Prime Minister Justin Trudeau, right, and outgoing Mexican President Enrique Pena Nieto signed an authorization for the deal on Friday morning in Buenos Aires. BUENOS AIRES — Signing on to a revamped NAFTA alleviates the serious economic uncertainty that lingered throughout the negotiating process, Prime Minister Justin Trudeau said Friday while flanked by U.S. President Donald Trump and outgoing Mexican President Enrique Pena Nieto at a highly-anticipated formalizing of the trade pact in Buenos Aires. "The new North American free trade agreement maintains stability for Canada's entire economy, stability that's essential for the millions of jobs and middle class families across the country," he said. "That's why I'm here today." The U.S.'s punitive tariffs on steel and aluminum from other countries remain in place, along with stiff countermeasures from Canada and Mexico. As negotiations to remove those tariffs dragged on in the past few weeks, Canadian officials and emissaries insisted Canada would not take part in a fanfare-filled signing affair until the levies were lifted. All that changed this week, said one insider: "At the end of the day, removing the uncertainty from the rest of the economy is too important to pass up." "There's much more work to do in lowering trade barriers and in fostering growth that benefits everyone," Trudeau said. "As a result, the tariff-free access NAFTA guaranteed for more than 70 per cent of Canada's total exports is secure. That's essential for businesses, families, jobs, entrepreneurs, and hardworking people in every corner of our country. " Trudeau raised the tariff issue before the three leaders emerged together for the signing ceremony, said officials in the Prime Minister's Office. At the beginning of his remarks, Trump also acknowledged the process to negotiate the United States-Mexico-Canada agreement has been "a battle." "Battles sometimes make great friendships, so it is really terrific," Trump said. Trump acknowledged that Friday was Pena Nieto's last day in office and congratulated him on the achievement of signing on to the deal. U.S. lawmakers have already indicated they don't expect to tackle the USMCA — or CUSMA, as Ottawa now calls it — until after the new Congress is sworn in early next year. It preserves a contentious dispute-resolution system the U.S. dearly wanted gone, extends patent protections for biologic drugs and allows U.S. farmers a 3.6-per-cent share of Canada's famously guarded market for poultry, eggs and dairy products — a concession that dismayed Canadian dairy producers. Earlier this month, a coalition of no fewer than 40 Republicans in Congress wrote to Trump urging him not to sign the agreement, expressing disdain for "inappropriate" and "insulting" language that commits the three countries to supporting and protecting sexual orientation and gender identity rights. Separately, a smaller group of Republican senators even tried to convince the White House to hit the gas pedal on ratification efforts, fearful that the new influx of Democrats in the new year would render congressional approval of the deal "significantly more difficult." "If we're going to see more plants going to Mexico, I'm not going to support NAFTA 2.0," said Michigan Rep. Debbie Dingell. "These are peoples' lives; these are people who work in my district and I'm working hard to keep those jobs here."